It is an exciting time to be a member of CCA in Oregon. With significant growth on the horizon, a full slate of contentious advocacy issues, and a focus on the fundamentals that have made CCA strong, there is a lot to stir the excitement. CCA Oregon will become successful by carefully balancing four key elements - membership, fundraising, advocacy, and communications. Like the four points of a diamond, no single one of these elements can exist or be effective on its own. But, by combining these points of focus, the organization grows stronger in influence in the political arenas that manage the direction of our fisheries and the future of our coastal resources - and it all starts and ends with the local chapters. We must have a strong and growing membership, not only to catch the watchful eye of vote-conscious politicians, but also to build the grassroots chapter boards to saturate coastal and inland communities with the proper conservation message and create the dollars to get things done. These boards find points of influence in the community and form the foundation of the organization as a whole. They raise vitally important funds through banquets and they reach into their communities and recruit members for the cause. From inception, CCA was founded on a committee system, and without strong grassroots, that foundation falls apart. From a local chapter board to the State Executive Board, every member matters. As an organization, CCA has set some ambitious goals in our advocacy program here in Oregon. The management of our fisheries has never been worse and we are reaping the grim rewards of a commercially biased system. In order to be effective in our advocacy program, we will need to focus on membership growth and chapter development. Even with membership solidly above 2,500, we have just scratched the very surface of the greater recreational fishing community. We must start new local chapter boards throughout Oregon, allowing more members the opportunity to participate within CCA"?s infrastructure and spread the influence of the organization. There is still much that can be done to improve membership retention and recruitment, and one of the easiest and most effective tools is each member simply signing up a friend, relative, or neighbor. It has almost become clich! ", but who cannot think of at least one person that he or she can sign up? With that basic membership drive alone, the math speaks clearly. We could double our membership. And, as we begin to work as a chapter to create membership drives and events, there is little we will not be able to do for our coastal resources. Fundraising is the heart of the CCA system. It is what fuels the conservation machine. 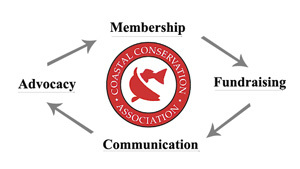 Each chapter must organize and execute a successful fundraiser for three key purposes: It raises valuable funds to feed the organization"?s work; It recruits new members through the banquet ticket membership; And it allows the local chapter members to touch the local community and involve people (both inside and outside of the angling public). If the local chapter cannot get organized to create a banquet, the state organization clearly will not be able to get organized to move the fishery management system. Communication is by no means the last leg of CCA's organizational focus, but rather it is the anchoring leg. Communication is the glue that holds the membership, fundraising, and advocacy of the organization together. It carries our message, accomplishments and vision to our membership, fisheries management leadership, and the general public, both inside and outside the fishing community. Without communication, we lose our grassroots and without our grassroots, we will whither and die. Anything that gets done in this organization is a function of many. We are blessed with a growing army of dedicated volunteers who will seek new members, execute fundraising activities, fill the state decision-making committees and carry the message of conservation. The stronger we get, the larger stick we carry to our legislators and fisheries regulators, and it all starts and ends with strong local chapters. With the legendary traditions and strategy of CCA behind us, it is exciting to imagine what lies ahead. And as long as we keep focused on the proverbial diamond, we will accomplish great things for fisheries resources in Oregon and the recreational anglers who enjoy them.